EA Mobile brings us one step closer to console-quality graphics on iOS. 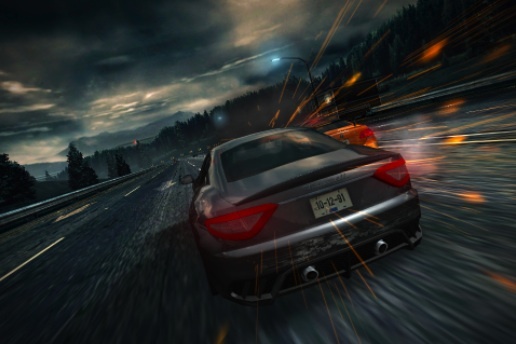 Need For Speed: Most Wanted revs its engines on Xbox 360 and PlayStation 3 later this year, and EA Mobile will be right there with an iOS version that should more than hold its own, providing the developer can push the iPhone and iPad hardware to a level of visual quality that would make the Real Racing team at Firemint blush. We may not know a whole lot about the handheld edition, but one thing's for sure, it's a looker. From the outset, EA's goal was to retain the fast-paced arcade style vibe the NFS franchise is famous for, while at the same time delivering a product that feels like a console game. Having played the handheld edition, we think the team succeeded. 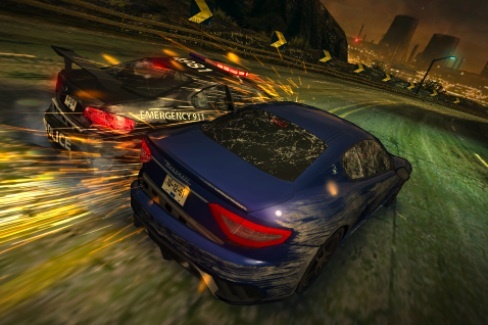 Most Wanted features some of coolest visuals on a tablet and smart phone, with real time reflections across each high-powered car, and for the first time, vehicular damage, including busted bumpers and scuff marks that appear after swiping rivals or slamming into dividers; sparks definitely fly. That said, the goal is to take out the other guys (fellow racers and cops), Burnout style, so expect to ram them from behind and push these computer opponents into walls. Cause enough destruction, and the game briefly pauses the race to show your newest victim spinning out of control, eventually winding up a twisted wreck. What's great about this is the physics-based collision system that guarantees random crashes each time you play. Beyond this, the game awards you Need For Speed points whenever you earn achievements, win races or obtain a good speed score against buddies. These go towards your ranking on the Most Wanted list, giving you a chance to beat friends on the leaderboard. Sounds a bit like Autolog, but EA won't commit to calling it that just yet. As for the gameplay, we had no trouble adjusting to the tilt controls, and the same can be said of pressing the break button to drift around corners, and using nitrous (swipe up) for that added speed boost. Everything felt really tight and responsive. Definitely a great sign with a few months to go before release. On that note, we wish EA told us more. The publisher wouldn't go into specifics about the number of cars, missions and tracks, but that'll change in the months ahead. For now, Need For Speed: Most Wanted is a gorgeous racer that may leave the competition sucking exhaust.